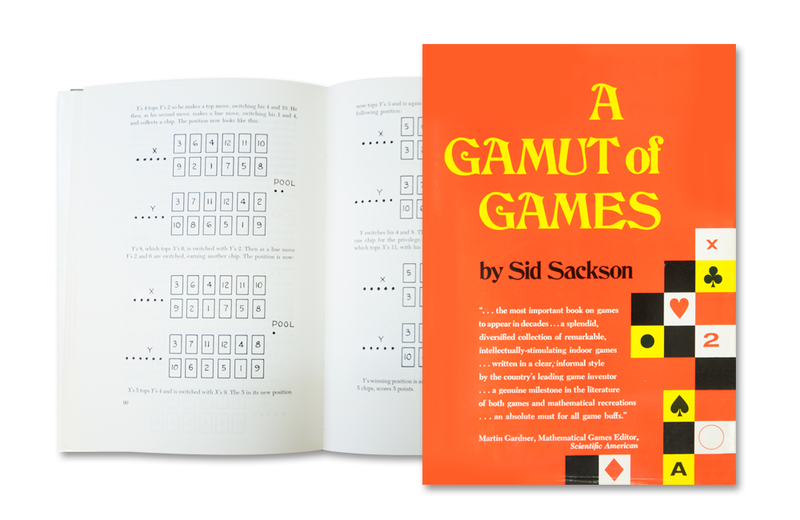 First published in 1969 by Castle Books, A Gamut of Games is an entertaining collection of 38 old and new strategy games that use traditional gaming staples, such as playing cards, dice, and checkerboards. Author Sid Sackson was both an authority on gaming history and a collector. Before his death in 2002, he had acquired one of the largest board game collections in the world, featuring more 18,000 titles. Sackson clearly presents each game using a series of diagrams and/or examples. These visual aids — coupled with descriptions focused on strategy, goals, and recommended number of players — clearly reflect the author’s command of and passion for the material. Some of my personal favorites include Blue and Gray, a Checkers variant; Plank, an advanced version of Tic-Tac-Toe; and Last Word, a paper-based Scrabble-like entry. While I found the presentation of each game fascinating reading, I also thoroughly enjoyed the introduction, where Sackson details why he included each game in the book. Each anecdote reads like an entry from his personal diary and reflects the strong ties he built over the years with other game designers throughout the world. First published as Funniest Fan Letters to Batman in 1966, FanMail '66 is a reprinting of a collection of letters sent to Batman during the height of the iconic television show's popularity.